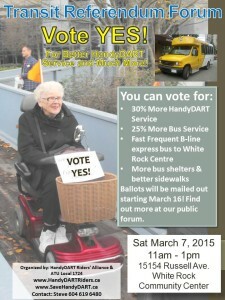 Thurs Nov 10 – Ask Mayors to Vote Yes to More HandyDART Service! The HandyDART Riders’ Alliance has been working for years to get regular annual increases in HandyDART service. And now your mayor will get a chance to vote YES to about a 13% increase in HandyDART service over three years. This is much better than the situation since 2009, and sets the stage for further increases in future years. The more people who show up, the more pressure the mayors will be under to make this a good plan for HandyDART riders and vote to support it. The formal vote on the Mayors’ Council Phase One Plan will take place later in November. The need for improved HandyDART service is so severe that the new TransLink CEO Kevin Desmond recently approved an emergency HandyDART budget top-up. HandyDART service hours were frozen in 2009, and as a result trip denials went up over 600% before the US contractor changed procedures to disguise the crisis. The growing population of seniors means the number of people with disabilities is increasing twice as fast as the rest of the population, and HandyDART service per-capita has been declining. This plan finally recognizes the need for more HandyDART buses on the road every year. We need further increases in the Second Phase of the Mayors’ Council Plan to keep up. For quality HandyDART service that meets the needs of people with disabilities and older seniors, HandyDART must either be brought in-house as a TransLink subsidiary or turned over to a non-profit agency. This question is being examined with input from the “Custom Transit Service Delivery Review Stakeholder Advisory Committee.” HandyDART Riders’ Alliance members Tim Louis and Patrick Maxcy are on the committee. 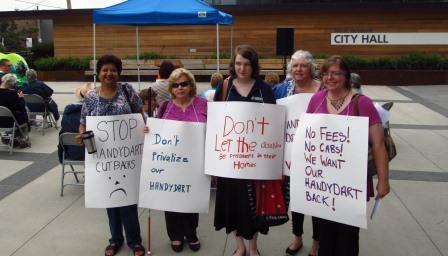 On Wed March 30th Keep up the Pressure for Better HandyDART Service! 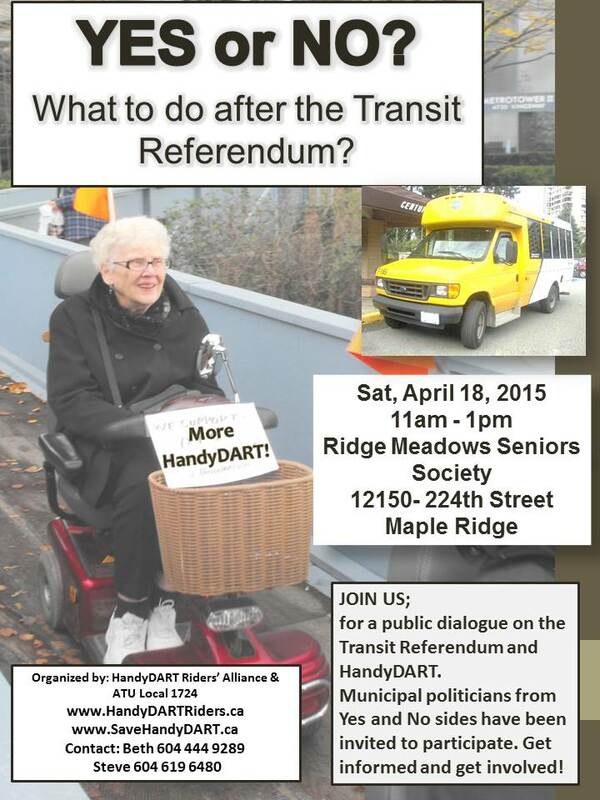 The HandyDART Riders’ Alliance has put out this call to action. Please help spread the word, and show up if you can! Yes or No: What to do after the transit referendum? Join us for a public dialogue on creating an accessible and age friendly region. Municipal politicians and other representatives from Yes and No sides have been invited to participate. • Why vote Yes? Why vote No? 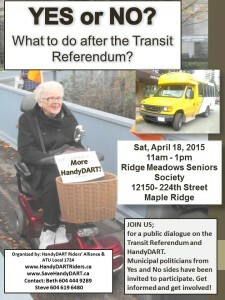 • Is better public transit, including more HandyDART, needed in Maple Ridge? • What will people on Yes and No sides do to create a better transportation system, win or lose? • Make your views known, and find out more about the Mayors’ Transit Plan. Join us for a discussion that goes beyond what to mark on your ballot. Find out why some Maple Ridge councillors are voting Yes, and others No. Many of us have already voted, and now it is time to talk about what is needed to create an accessible and age friendly region. HandyDART service hours have been frozen since 2009, and as a result trip denials went up over 600% before the contractor changed procedures to disguise the crisis. Service quality has also deteriorated, with riders routinely forced to wait for hours. The Mayors’ Council Plan includes a 30% increase in HandyDART service with a Yes vote – but what happens to HandyDART if the No side wins? It is not too late to register and get a ballot, and we need your involvement regardless of the outcome of the transit referendum! Find out more at our public dialogue.